Click the images below to see larger samples of the campaign materials available for purchase. 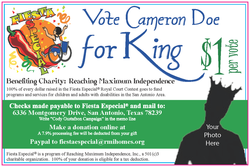 All materials produced by candidates independently of Fiesta Especial must be approved prior to being used in a candidates campaign. * Free customized facebook cover photo featuring your donation URL.